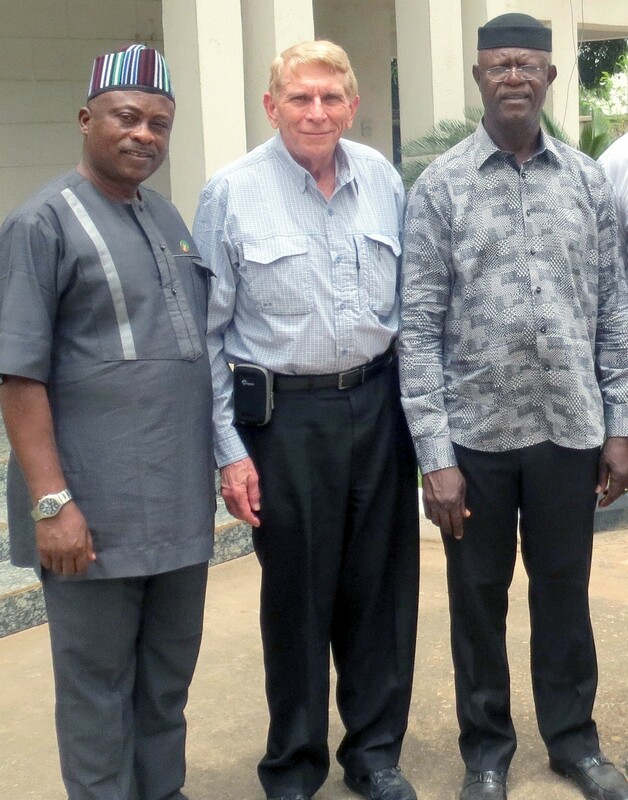 Honorable Terwase Orbunde, chief of staff to Governor Ortom, William J. Murray and Deputy Governor Benson Abounu. I originally had a meeting scheduled with Governor Ortom but he was called away to the capital to meet with the President of Nigeria. As a result, I spent a good deal of time with the Deputy Governor, Benson Abounu, who is by trade an engineer. A deputy governor is equivalent to a lieutenant governor in the United States. Deputy Governor Abounu took time to describe in detail the situation of Christians and the current state of Internally Displaced People (IDP’s). All of the IDP’s are Christians driven from their homes by Muslims from the north of Nigeria or from neighboring African nations. He explained that besides the 175,400 displaced Nigerian Christians, there are Christian refugees from the neighboring nation of Cameroon who have fled Islamic terror. The United Nations reports that 12,100 Cameroonians have registered as refugees in Benue, but it is estimated that there are at least 34,000 total. Deputy Governor Abounu told me that the cost of caring for the refugees and IDP’s is a strain on the budget of Benue State. The last census was in 2006 and there are only estimates, but the current population of Benue State is probably only 8,000,000 with most of those being poor farmers. The capital, Makurdi, is the largest city and only has a population of 500,000 or less. Deputy Governor Abounu made arrangements for our team to visit attacked villages and IDP camps. He also made arrangements for a government official to meet us in Agatu. Our goal that same day was to reach a church where 113 Christians were killed during a church service. 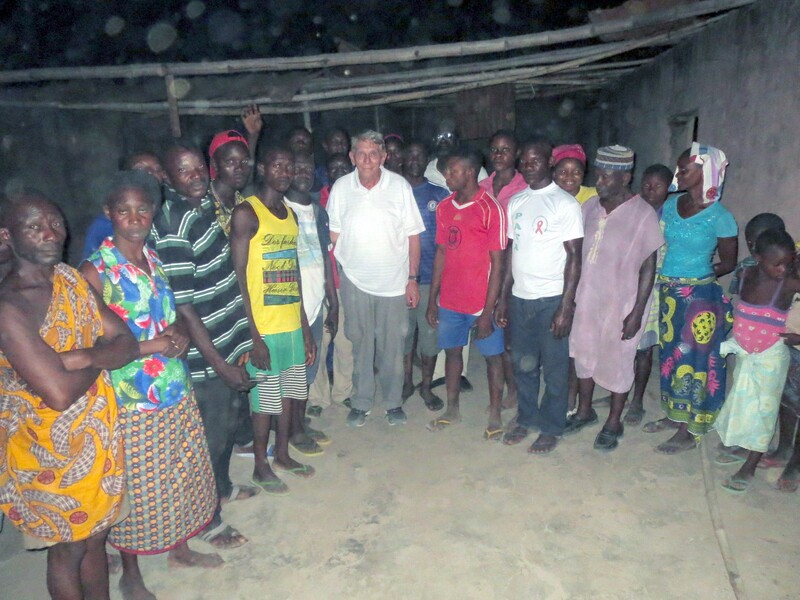 Because of our lengthy meeting with Abounu, our team would arrive after dark. We drove south for many hours from Makurdi and stopped briefly at Agatu town, then headed to the village where the attack occurred. When the paved road stopped we had to change cars to continue at under five miles per hour on a dirt road that was more path than road. We passed several villages with many destroyed homes. About half the population had returned having nowhere else to go. The homes and small businesses are built from sun dried straw bricks that are not kilned. With the roofs torn off, during the rainy season the mud bricks melt away and the homes begin to vanish. 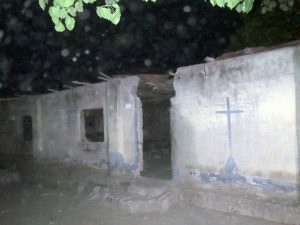 Still, some Christians had returned to what was left of their villages despite the promise by Islamic radicals to drive them out again. Remains of the Agatu Church. Only the shell remains but services are still held there where 113 died. 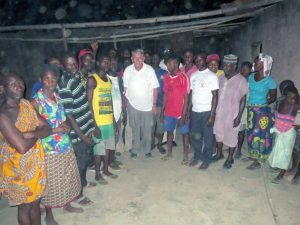 William J. Murray with survivors of the Agatu church massacre. Note that the roof is missing. The inside of the church was set on fire so there are no pews or chairs. about 35 or 40 in all. A total of 113 were murdered on that fateful day two years ago during a service. The Muslim Fulani Herdsmen came with guns and machetes — and the Christians were armed only with their Bibles. Security was an issue because of how late we had arrived. The two off-duty police officers we had hired to accompany our team were clearly concerned as it was too dark to see any developing threats. Although the attack on the church occurred more than two years ago, there have been recent attacks as well. The previous week, two farmers were hacked to death. 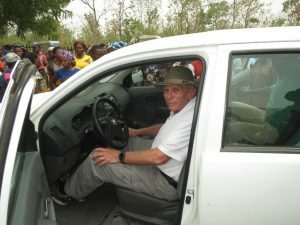 Despite the high profile of the attack, I was told that I was the first Westerner to visit the church since the attack. Please keep that in mind when I report on my meeting at the European Union Ambassador’s home two days later. The man who escorted our team to the church was a local official. The morning of the attack, he had talked to his brother who was a member of the church. The official had plans that morning, but he expected to stop and see his brother in the afternoon. His brother did not answer the phone. When he approached the village, the roads were blocked and gun fire could be heard. His brother was one of the 113 killed in the attack on the church. Many of those I met at the church had lost relatives and neighbors in the massacre. Although fund transfers are difficult, I am arranging to pay for a new roof for the church. From burned out church to mansion: As a part of my work I have been in the homes of many ambassadors for receptions. All have been mansions, and the way ambassadors live costs their nations hundreds of thousands and sometimes millions of dollars a year. The residence of Ambassador Ketil Karlsen was one of the most extravagant I have ever visited and I am sure most European Union facilities for ambassadors around the world are the same. Emmanuel Ogebe and I were invited to a reception at the large and impressive walled residence. The reception was held in honor of a visit by the European Parliament Subcommittee on Human Rights. The delegation had been in Nigeria two days and had already met with “high ranking officials.” “High ranking officials” translates to meetings in wood paneled offices with expensive furnishings. At the beginning of the reception Ambassador Karlsen and a member of the subcommittee pronounced how much they had learned about the current situation of ethnic “clashes” in Nigeria. As individuals had an opportunity to talk I spent some time with Mikoslav Mikolsik, a member of the Slovakia’s parliament. He represents the Slavic faction of the new People’s Party which is socially conservative — something new in the EU. When he asked me about my mission to Nigeria, I told him that I had just returned from the Agatu region and had visited a church where 113 were killed by Muslim Fulani herdsmen during a service. MP Mikolsik’s face got a look of pure shock and all he could say to me was, “at their church? !” I told him “yes,” and explained the circumstances. I then told him of the IDP camp I had visited in Benue State where all 175,000 IDP’s were Christians. MP Mikolsik was flabbergasted by my revelations despite the fact that the “fact finding” mission he was on to investigate “human rights abuses” was in its third day. You see, the official line from the Muslim-run Nigerian government is that there is no persecution of Christians in Nigeria, even in the thirteen states in the north that enforce Sharia Law. The massacres of Christians are held to be either “ethnic clashes” or the work of “criminal gangs.” Is there Muslim on Muslim violence? Yes. Currently a Shia Muslim leader is being held by the government and Shia Muslims do feel they are persecuted by the Sunni Muslim majority. But they do not face the out-and-out massacres the Christian population faces. I did not find the lack of knowledge of the facts on the ground in Nigeria by the EU team odd at all. Sadly, I see this all the time, even in Washington. I have been in meetings as recently as last month and heard a U.S. Senator say that 90% of Iraqis are glad America invaded and got rid of Saddam Hussein. The only Iraqis who are “glad” are those America has put in power and made rich. It is those corrupt leaders Senators meet when they visit. The reality in Iraq, except for the Kurds, is very different. Most believe the United States invented the Islamic State (ISIS) as an excuse to continue to occupy their nation. Many have told me they were better off before the American invasion. We did what little we could: The conditions at the IDP camp our team visited in Benue State were far worse than anything I had seen in Iraq. Previously, the worst I had seen was a camp in the Darfur area of the Sudan when I was there in 2006 on a fact-finding mission. The situation was so bad in Darfur that one of our team members contracted hepatitis. Before arriving at the IDP camp we stopped by the “Modern Market” which could best be described as a wholesale market for street vendors and small shops. The wholesalers did not have large warehouses, but rather small rooms dedicated to just a few products. We were there to buy diapers and feminine products, as we had been told there was a desperate need for them at this particular camp. Using what cash we had with us, I bought 100% of what was available even though it would help only a small percentage of the more than 15,000 women at the camp we were to visit. The IDP camp contained about 34,000 people, mostly women and children. We also brought protein meal to mix with the cereals the government was providing for the children. Hundreds of the women who were near the entrance to the camp rushed forward to see what aid might be available and had to be held back by camp security. Small children with nothing to do were milling about throughout the camp. Financial transactions in Nigeria are difficult and moving funds to Nigeria from the United States is even more difficult. Just purchasing the small number of supplies we did for the IDP camp was a challenge. While there, we learned that there had been a measles outbreak among the children at the camp. With conditions so crowded, disease can spread quickly. I really wish the Religious Freedom Coalition could help these people more, but IDP camps this large are just out of our scope. A major international effort is needed to help these displaced Christian families, but that will not happen as long as the European and American governments pretend that there is no Muslim violence against Christians. There are some very specific areas where the RFC can help — such as building a water and sanitation system for the Christian orphanage in Miango and making repairs to some of the burned out churches. We can make the lives of some people better, but our real challenge is the work that needs to be done on Capitol Hill to silence the whole “Islam is a religion of peace” mantra from Democrats and even some Republicans. We need to wake up our politicians to the dangers Christians face in the world! Please pray for our missions.